The Phantom Planet is a 1961 independently made American black-and-white science fiction film, produced by Fred Gebhardt, directed by William Marshall, that stars Dean Fredericks, Coleen Gray, Anthony Dexter, and Francis X. Bushman. The film was released in the U.S. by American International Pictures as a double feature with Assignment Outer Space. In 1980, the United States Air Force’s Space Exploration Wing has bases on the Moon, and it is on the eve of a mission to Mars. When another of its two-member crew Pegasus spacecraft mysteriously disappears, rumors begin circulating of space monsters and phantom planets. Captain Frank Chapman and his navigator Lt. Ray Makonnen are ordered to investigate. During the search, their spaceship suffers damage from a meteor shower, requiring that both men go outside to make repairs. 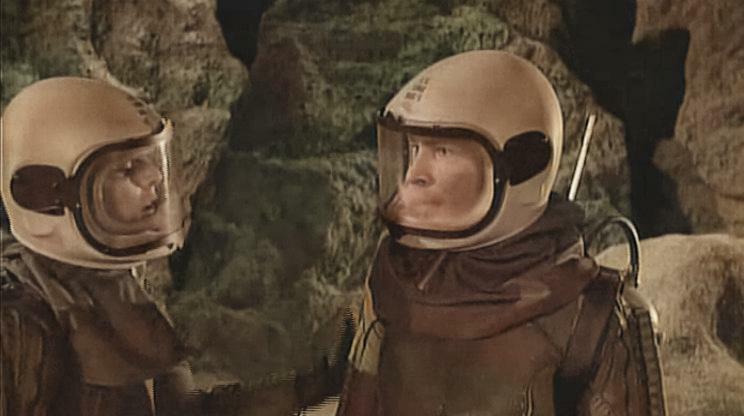 A bullet-sized particle, however, pierces the air hose on Chapman’s space suit, rendering him unconscious. Makonnen is able to repair the hose, but as he opens the airlock hatch, he is fatally struck by a similar particle. Makonnen’s last act before being propelled into deep space is to push Chapman inside and close the airlock hatch. Chapman comes to and finds Makonnen gone and himself unable to communicate with the lunar base. He records a log entry about the preceding events, noting that he now must make a forced landing on an asteroid, that it is somehow pulling in his Pegasus spaceship. Exiting his ship while still feeling the effects of the accident, Chapman collapses and sees tiny humanoids about six inches tall approaching. Once his helmet visor is opened, he can breathe but shrinks to their size due to the asteroid’s atmosphere. He is taken underground. Sesom, the aged and wise ruler of Rheton (the native name for the rocky and seemingly lifeless planetoid where Chapman has landed), explains that though his craft was brought down safely by their gravitational tractor beam, they had not been able to do same with the preceding Earth spaceships that came near, which were completely destroyed, along with their crews, when they crashed on Rheton’s surface. He informs Chapman that he never can leave but will have all the rights of a citizen of Rheton. As he slept, Chapman’s spaceship was sent into space to keep Rheton’s existence a secret, and more importantly, their world’s gravitational technology, which allows the Rhetonians to navigate their world through space. Chapman meets two beautiful women: Sesom’s smugly spoiled blond daughter Liara and the gentle but mute black-haired Zetha. Liara is more than willing to answer his many questions about Rheton. Sesom informs Chapman that he later may marry one of the women once he has become accustomed to living on Rheton. Liara, after following and engaging constantly with Chapman, declares her love for him, but Chapman, still eager to return to his own people, quietly rejects her. Herron, a young man who is in love with Liara, attempts to win her for himself by lying to Sesom, telling him Chapman is attempting to win over both women. Stating that he believes this to be a crime against the people of Rheton, Herron requests a duel to the death. Chapman agrees, and the two engage in a form of combat where opponents must push each other onto gravity plates that cause immediate disintegration when touched. Just as Chapman is about to push Herron onto a plate, he lets Herron go, stating that he cannot kill someone for no reason. As time goes on, Chapman and the mute Zetha become acquainted and eventually fall in love. Herron comes to Chapman late one night and offers to help him escape. Any plans for the future, however, are put on hold when Chapman discovers the reason for Rheton’s erratic course through space: It is because the planetoid is being attacked by the Solarites, an alien race of “fire people” from an unidentified “sun satellite”. They want to destroy Rheton with their flaming fighter craft so they can steal its secret of gravitational control. With Chapman’s help, Sesom and Herron destroy the enemy fleet using a gravity beam. During the battle, a giant 7-inch tall Solarite prisoner, captured during a previous raid, escapes when the gravity barrier holding him fails. Stalking corridors, the creature captures Zetha, who previously had been traumatized into silence by a childhood encounter with the savage species. After Sesom is attacked by this bug-eyed monster, Chapman and Herron attempt to rescue Zetha. Chapman defeats the Solarite by pushing it onto a gravity plate. While kidnapped, Zetha’s muteness vanished when she saw Chapman about to be attacked by the creature, and she was able to scream, warning him. The return of her voice allows her to later confess her love for him. The two kiss, but Zetha knows that he must return to his home world. They are interrupted when a search party from Earth locates Chapman. In order to preserve the secret of his adopted people, Chapman crawls inside his spacesuit, and after once more being exposed to atmospheric gases from Earth, he returns to his normal size. Reluctantly, he goes with the search party, leaving Zetha and the miniature world of Rheton behind.